Gauche Wood, Nr Gouzeaucourt, Cambrai"
Third son of Francis George & Phoebe de Faye (nee Kinsey) of 21 David Place, St Helier, Jersey and Pamproux, La Rocque, Grouville, Jersey. Educated at Victoria College. Entered Jersey Branch of London City & Midland Bank in 1907. 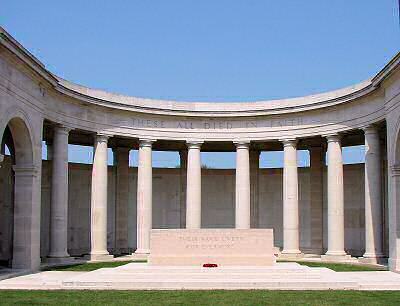 Roll of Honour. 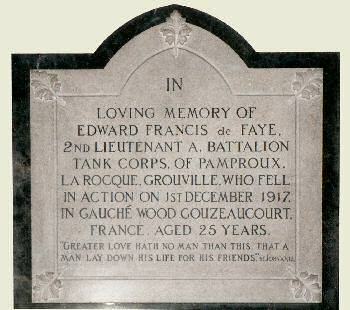 The sympathy of all our readers will be extended to Mr & Mrs F G de Faye of David Place and Pamproux, La Rocque when we state that they have received the sad news that their third son, 2nd Lieutenant Edward Francis de Faye of the Tank Corps, has been killed in action. This popular officer was educated at Victoria College and entered the London City and Midland Bank, Hill Street branch. He was a vocalist of considerable merit and was a favourite on any concert platform. In July 1915 he enlisted in the Motor Transport Section and proceeded to France in September of the same year, he was rapidly promoted to the rank of Sergeant and in 1916 was sent back to England to obtain a commission. 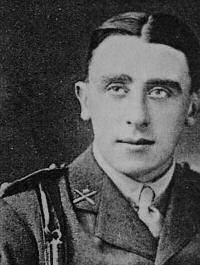 He volunteered for the Tank Corps, which was just then being formed, and was gazetted as 2nd Lieutenant in this unit in January of this year. Shortly afterwards he again proceeded to the Western Front and had been in all the heavy fighting since April at Messines Ridge, Menin Road and the recent battle of Cambrai. He was on short leave in Jersey at the end of October and wrote home on 28 November, a very cheerful letter saying he was quite safe and with his tank in a captured village. Since then, however, he has been called upon to make the supreme sacrifice. The late Lieutenant, who was 25, was very popular and highly esteemed locally, cheerful and sincere he was most inspiring through his hopefulness. The family have our heartfelt sympathy in their great loss.